Antique Radio Forums • View topic - Grundig Satellit 6001 thermistor (? )-what is it? Grundig Satellit 6001 thermistor (? )-what is it? Post subject: Grundig Satellit 6001 thermistor (? )-what is it? I'm working on a 6001 for someone at my radio club. The problem I am having is Bands 2-9 will play for some short period of time and then start fading out and eventually the reception dies completely. Switching to LW/ AM / SW1 or FM for a few minutes or turning the set off and then back on after a few minutes will allow bands 2-9 to work again, and then slowly die as before. I've determined that the 2nd local oscillator gets weaker and weaker, eventually stops oscillating, which is why the reception dies. It is the diode shown in the schematic snippet above, next to T3. It shows as a diode on the schematic, but it ain't exactly that. it appears to be a component that varies resistance by temperature. 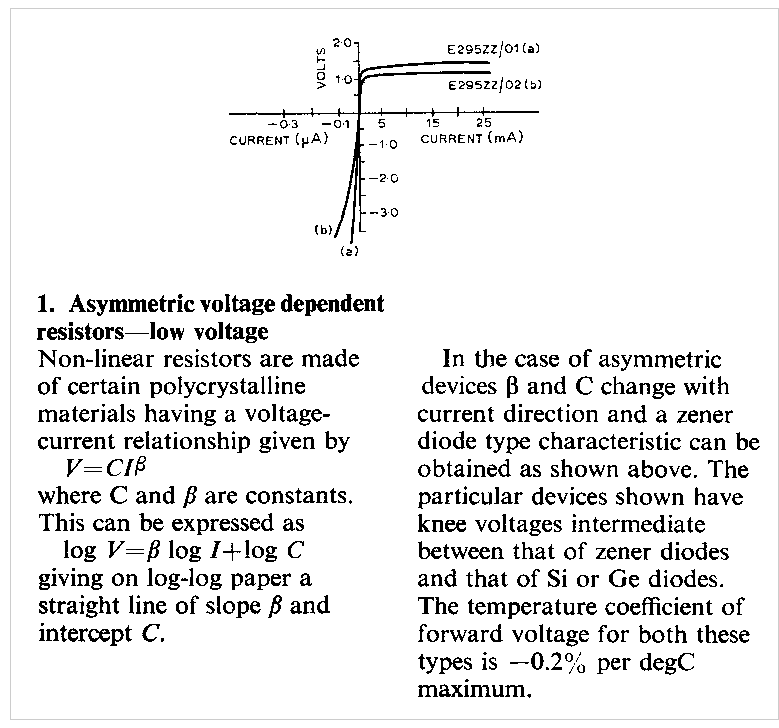 When I google the number shown on the schematic, the (very few) hits that come back reference a "non-linear resistor". What is a modern replacement for this device? I see some vendors selling a FAMILY of components under the 2322574 number shown on the schematic, listing several different values of components instead of a specific one. I'm assuming the bands on the body mean something, but I can't find a color code for this device. Does anybody know? Post subject: Re: Grundig Satellit 6001 thermistor (? )-what is it? This is not a thermistor. The symbol is quite different. OK, it is not a thermistor, it is a varistor. So, where do I get the equivalent component in modern times? Most varistors I see online are the type used in power strips and power supplies to absorb line spikes. This is obviously very different from that. It's supposed to change its resistance a bit in accordance with small changes in the applied voltage. I'm assuming that this was put in there to compensate for variations in battery voltage as the D Cells run down. It seems to be breaking down slowly as power is applied to the circuit and pulling critical voltages in the 2nd converter oscillator down enough to stop oscillation entirely. If the part is NLA, I'm wondering if a couple of diodes in series might do almost the same thing. There are three of those puppies in your radio. one at the base of T9 RF board, and one at the base of T12 FM tuner board. That diode with T3 composes a current source for the T4 transistor, which looks to be a grounded base oscillator stage. The schematics shows 1.25V voltage drop across that diode (it is biased in the forward direction). I would replace that component with two regular Si diodes (1N914 or similar) in series.